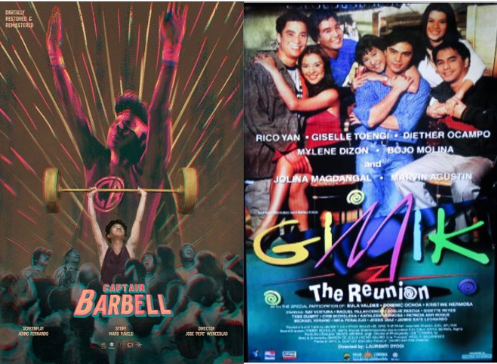 The Intersections & Beyond: "Captain Barbell" and "Gimik:The Reunion" featured in ABS-CBN Film Restoration's "Reelive the Classics"
"Captain Barbell" and "Gimik:The Reunion" featured in ABS-CBN Film Restoration's "Reelive the Classics"
Captain Barbell and Gimik: The Reunion were featured in ABS-CBN Film Restoration’s two-week-long festival dubbed as “Reelive the Classics” from March 13 to 26 at the Santolan Town Plaza in Quezon City. The festival, which brings the digitally-restored and remastered Filipino movies, re-introduced Mars Ravelo’s Pinoy superhero Captain Barbell which starred the King of Comedy, Dolphy, to fans and new audiences. Dolphy stars as the Pinoy caped-crusader and his alter-ego, Teng-Teng. The 1973 production was directed by Jose "Pepe" Wenceslao and starred Lotis Key, Panchito, Babalu, and features the special participation of a young Maricel Soriano. Rex Ravelo, Mars Ravelo's son shared that his dad created Captain Barbell for Dolphy. "Captain Barbell was made specifically for Dolphy and my father and him are good friends. The movie is really a spoof of Captain Marvel. It was supposed to be a real comedy because of Dolphy but it turned out to be a hit superhero movie and the rest is history," Rex stated. Dolphy's son, Ronnie Quizon recalled that after his father and Ravelo's first movie together, Facifica Falayfay, almost all of Ravelo's characters resembled Dolphy. Meanwhile, the follow-up to the movie that launched its teen stars, Gimik: The Reunion brought together its director and crew, as it premiered last March 14. Director Laurenti Dyogi shared his enjoyment in watching his film again after 20 years. The premiere screening of his digitally restored and remastered film became more special because coincidentally it was the late Rico Yan's birthday and his birthday last March 12. "I can't even remember making this film. Today is a special day since it's Rico Yan's birthday and my birthday was two days ago. My wife was just reminding me that on my birthday I was shooting a car scene for this movie. I'm excited to see the whole movie again for the first time in the big screen," he expressed. Gimik: The Reunion, which celebrates its 20th anniversary, starred some of ABS-CBN’s early young stars such as Judy Ann Santos, Rico Yan, Marvin Agustin, Jolina Magdangal, Giselle Toengi, Diether Ocampo, Mylene Dizon, Bojo Molina, Kristine Hermosa, Kathleen Hermosa, Dominic Ochoa, Patrica Ann Roque, Rica Peralajo, and more. Movie aficionados will also be able to catch hits and critically-acclaimed movies at “Reelive the Classics,” including the John Lloyd Cruz-Bea-Alonzo starrer One More Chance and Aga Mulach and Lea Salonga’s Sana Maulit Muli, Dekada ’70, Banaue, Karnal, Tag-Ulan Sa Tag-Araw, Kung Mangarap Ka’t Magising, Nasaan Ka Man, and Ikaw Pa Lang ang Minahal. Students can enjoy the movies at a discounted rate of P100 while regular patrons can watch them for only P200. For updates, follow @abscbnpr on Facebook, Twitter, and Instagram, or visit www.abscbnpr.com.